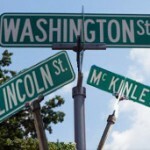 How did these streets located in the city of Wooster, Ohio get named in honor of three presidents of the United States? 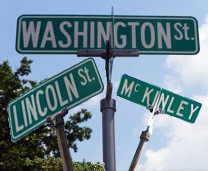 Turns out theres actually an interesting story behind the naming of Washington, Lincoln, and McKinley streets and the manner by which that whole section of town was added to the City of Wooster. On July 18, 1910, the Wooster Board of Trade (which later became the Wooster Chamber of Commerce), invested $18,000 to purchase the 40-acre Grady-Odenkirk farm, the majority of which was located on the north side of E. Bowman street. 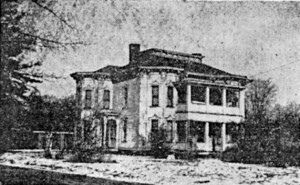 The big old main house on the property was located at what is today 910 E. Bowman St. at the NE corner of Lincoln and Bowman streets. Old image of the Grady-Odenkirk House located at 910 E. Bowman St. on the NE corner of Lincoln and Bowman streets in Wooster, Ohio. Israel Grady and his wife Sophronia (Milbourn), moved to Wooster after securing 40-and-half acres of wild and barren land from 17 different land owners. They built the huge wood frame house that had 7 to 8 rooms on each floor and a cellar full of storage rooms, in 1881, and set about improving their entire tract of land. Their property was soon transformed into a veritable showplace that included a 300ft long fish pond with an island in the middle where a little summerhouse stood, that took Mr. Grady two years to excavate and build. There was also a smaller fishpond, about 50ft in diameter, in the front yard with a fountain feature. The Gradys graciously allowed townspeople to come and enjoy their large pond and park-like property. He kept the pond stocked with carp and it was reported that as many as 1500 people came in a single month to enjoy a boat-ride on the fishpond. Hundreds of sightseers would paddle out the to the island in the center and feed corn to the greedy fish or spend a lazy summer afternoon trying to catch one of those whopper carps at the end of a fishing line. The Gradys had two children, a son Josiah M. Grady, and daughter Huldah Grady. It was Huldah, who married Isaac H. Odenkirk, that inherited the property from her parents and it became known as the Odenkirk place. Eventually the Odenkirks decided to sell the property to the Wooster Board of Trade in 1910. The Board of Trade was organized in 1900 to work on building a bigger, greater and better Wooster. From 1900 to 1910 they raised over $40,000 to help rebuild the University of Wooster after the devastating fire of 1901 that destroyed Old Main. Through their efforts they helped to get the Gerstenslager Company to move to Wooster and build the magnificent buildings opposite the Penna. depot in 1907. They invested $20,000 toward a glass works factory, which through improper management went bust, but through legal proceedings were able to recover $17,000; which they used to buy the Grady-Odenkirk property. Grady-Odenkirk House built in 1881 still standing at the NE corner of Lincoln and E. Bowman streets in 2013 was once won as a prize for a $257 investment during the Wooster Board of Trade allotment lottery. Since there was a housing shortage in Wooster in 1910 the Board of Trade immediately set about platting their new allotment and dividing the old farm land into 300 lots. The executive committee determined that each lot would be sold for a flat fee of $257, which would amount to about $59,100 in profits on their $18,000 investment. However, lot purchasers could not pick the lot they wanted as some of the lots were more valuable than others either because of their location, or the fact that they already had structures on them: barns and houses. Therefore the Board of Trade decided the best and fairest way to distribute the lots was by lottery! Buying a lot for $257 gave you a chance at drawing one of the prized and valuable properties. The most coveted lot was No. 2216 that had the huge Grady-Odenkirk house on it. Other lots that had buildings on them were: lot No. 2213 that had the main house’s barn on it, Nos. 2534 and 2435 out on E. Bowman St. south side that had a barn and house respectively, and No. 2490 on the west side of Washington St. south of Bowman, and the house on lot No. 2486 on Nold Ave.
Gerstenslager Team: George Gerstenslager, captain; Charles Gimble, secretary; T. L. Flattery, John Johnson, William H. Long, Marion McCoy. Freedlander Team: Herman Freedlander, captain; E. W. Thompson, secretary; Ed Shupe, W. H. Zaugg, W. A. Craig, J. M. Ginter. Dix Team: S. C. Dix, captain; J. J. Keister, secretary; W. H. Barnhart, W. B. Bryson, H. Barrett. Van Nest Team: M. M. Van Nest, captain; Wallace Schmuck, secretary; Israel H. Odenkirk, John McClure, Ed Hauenstein, W. H. Bliss. Gray Team: C. M. Gray, captain; C. M Tawney, secretary; H. A. Hoffstott, C. A. Weiser, W. F. Kean, W. H. Wiler. Wertz Team: Ed S. Wertz, captain; Max Bloomberg, Emmet Lee, F. Alcock, D. Nice, Oscar Foss. Amster Team: Nick Amster, captain; Dr. R. Biechle, secretary; W. G. Christy, Charles Wolfe, J. Frederick. Paumier Team: E. Paumier, captain; Harley H. Zeigler, Robert Woods, J. W. Hooke, H. McClarran, A. D. Metz. A big parade and rally was held the night before the teams were to go out and start selling to help get the word out about the allotment sale and get the teams fired-up for selling. The citizens of Wooster turned out in body to watch the parade, the biggest civic parade Wooster has ever seen. All the factories in town were represented in the parade and some of them were of very unique appearance in the line of the march. The rally held at the City Opera House was filled to capacity and the crowd remained while enthusiastic speeches were made by the leading citizens of the day. Amster Team: 25 lots sold. Freedlander Team: 25 lots sold. Van Nest Team: 21 lots sold. Gray Team: 16 lots sold. Wertz Team: 16 lots sold. Dix Team: 14 lots sold. Criley Team 12 lots sold. Paumier Team: 11 lots sold. Hudson Team: 10 lots sold. Gerstenslager Team: 5 lots sold. It did not take the teams long to sell most of the remaining lots. By the Spring of 1911 the question was raised on what to name the three new streets running north and south through the Board of Trade allotment? The Board decided rather than picking the names themselves or allowing the City Council to decide what the names would be, that the new lot owners themselves should choose what names would be given to the streets. The voting coupon printed in the Wooster Daily News for lot owners to name the three new streets in Wooster. While naming the streets was democratic, the distribution of the lots was all chance. By 6PM on April 20, 1911 the lot owners and curious spectators crowded into the City Opera House where the Board of Trade called the meeting to order and A. D. Metz explained how the lots would be distributed. The plan was to put 300 numbers thoroughly mixed, each being the number of one of the lots, in one churn. Then put the 300 names of buyers in a separate churn. Then two young men were to draw out numbers and names. One drawing a number from one churn, while the other drew a name from the other churn. Two clerks would then record each number and name as it was drawn. Then the number was to be handed to one of three judges and the name was handed to a second judge. The number and name were then read aloud to the audience. Both cards would then be handed to the third judge, who sealed them in an envelope which was then given to the new owner who was requested to step forward and accept his envelope when his name was called. William Horn Jr. and James Sullivan were the young men chosen to draw the cards from the churns. James Rahl, Harry Power, and William Barnard served as the judges, while Arthur Leighty and Glenn Shoup recorded everything as clerks. The anticipation in the crowd was palpable by the time the first lot was drawn. Arch Dice, employed at the Wooster Brush Co. drew the first lot, No. 2339, located on McKinley St. near University St. Several choice corner lots were drawn early in the lottery but it seemed like forever before the first prized lot was drawn. So when Maynard Meyer, a hard working carpenter drew lot No. 2486, that had a house on Nold Ave. on it, a hardy round of applause arose from the crowd. There were several thrills and shrieks as numbers near the big house were drawn like when Harley H. Franks drew the barn on lot No. 2213. Then Leo Dunkle, a young man living with his parents drew lots No. 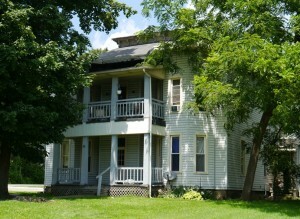 2435 and 2436 on which the McSweeney house on E. Bowman St. was located. He received two lots because the house extended over both lots and the two lots were joined as one. Jesse Marshall won the barn next to the McSweeney house on lot No. 2434 on E. Bowman St. The crowd grew antsy and the suspense was intense as the drawing proceeded because the number for the big Grady-Odenkirk house was still rolling around in the drum after about 200 lot numbers had been drawn. Finally the card everybody was waiting to hear was drawn and judge Harry Power smiled and read, No. 2216. A silence spread over the crowd as second judge W. E. Barnard looked at the card in his hand, smiled, and announced that Wesley H. Zaugg, who was serving as the County Treasurer at the time, had won the big house. A roar of applause and calls for a speech came from the audience. Graciously Mr. Zaugg stated that speeches would be in order after the drawing was over and took a seat while the remaining lots were drawn. A large part of the crowd left the building after learning who had won the big house, but those whose names were still in the drum remained to learn which lot would be theirs. The last name and lot was finally drawn around 9PM. Many of the lots were for sale the very next day, but many of the people who bought a lot planned to build new homes on them. After the drawing it was learned that Wesley Zaugg was not the sole owner of the big house as he had entered into an agreement with his sister, Pearl Zaugg, and Carey Grossenbach and his two sisters, Flo and Minnie Grossenbach, to pool their chances together. Wes and Pearl Zaugg had each bought a lot and the three Grossenbachs bought one lot together. The five agreed that if one of their three chances drew a prize, it was to be equally divided into three parts. Before the drawing Miss Minnie Grossenbach had predicted they would win and everybody laughed at the time. Minnie Grossenbach frequently amused her friends by telling fortunes with cards. Previous to the drawing, the five had gathered to make the agreement, Minnie asked for a deck of cards and said that she was going to determine whether or not they would win the big house. Minnie Grossenbach stated that, “the matter is decided now, and the drawing tomorrow night is only a formality.” Her words proved to ring true and her reputation as the greatest local fortune teller was cemented in local history. On April 7, 1911, Wooster City Council approved and accepted the plot of land of the Wooster Board of Trade’s Addition to the City of Wooster and the streets and alleys were dedicated for public use and the streets of Washington, Lincoln, and McKinley were woven into the history of the City of Wooster. 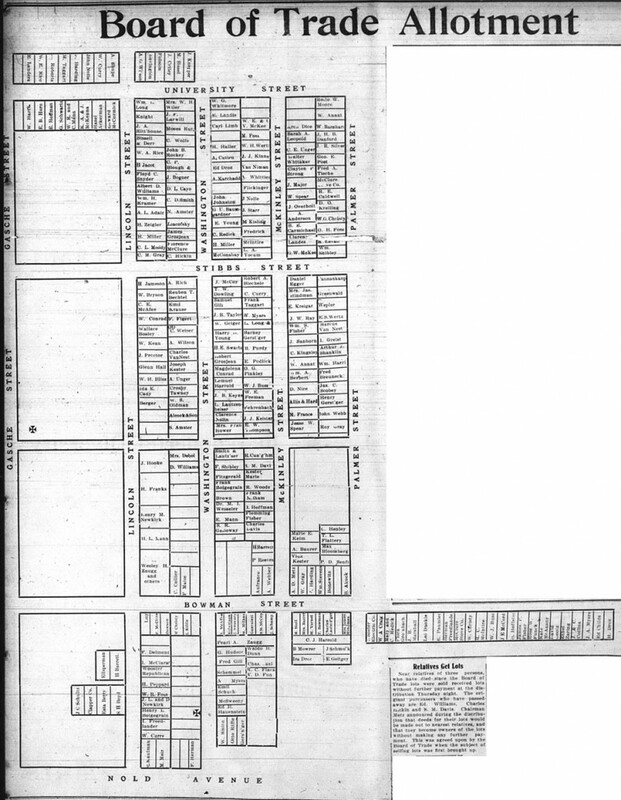 The diagram printed in the Wooster Daily News on APR 21, 1911 p. 5 showing the names of all the new lot owners after the lottery. John F Marchand my Great Grandfather lived on 97 N. Buckeye around 1920. Ran the Wooster Daily Journal. Can not find is home on 97 N. Buckeye – does it still stand. The Buckeye address seem to have changed?